Lynn is a friendly, professional therapist, working from a home-based beauty salon which is fully air conditioned, set in a calm and relaxed environment tucked away in Ash Vale. 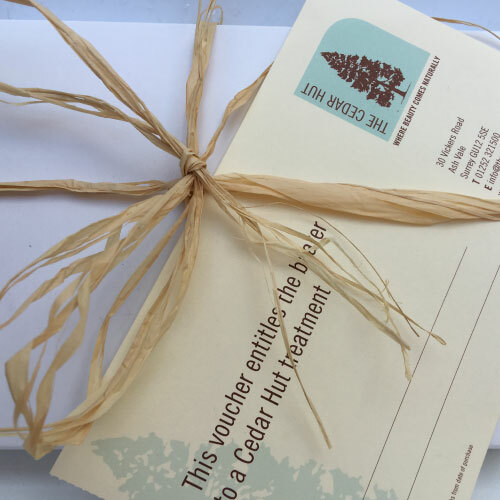 At The Cedar Hut you will enjoy taking time out to treat yourself, or perhaps, someone else. Lycon wax is loved by a lot of celebrities. Lycon hot wax is 100% hygienic, 50% less painful than other waxes. There is never double dipping in to the wax pot, a new spatula is used everytime! Would you like to treat a someone special? Look no further… Gift Vouchers are only a phone call away. You may purchase a treatment or a monetary value. The vouchers come boxed and are valid for 6 months only. The Cedar Hut will only use top quality products … as only the best is good enough for you!